On Saturday (16 January) the British newspaper published an exclusive report according to which James Clapper, the US Director of National Intelligence, was instructed by the US Congress to conduct a major investigation of clandestine Russian funding of European parties over the last decade. Washington is reported to be concerned about Moscow’s determination to exploit European disunity in order to undermine NATO, block US missile defence programmes and revoke the EU sanctions on Russia imposed after the annexation of Crimea. A dossier of “Russian influence activity” identified Russian influence operations running in France, the Netherlands, Hungary as well as Austria and the Czech Republic. The US intelligence review will examine whether Russian security services are funding parties and charities with the intent of “undermining political cohesion”. Officials declined to name such parties, but it is thought likely to include far-right groups including Jobbik in Hungary, Golden Dawn in Greece, the Northern League in Italy, and France’s Front National which received a €9 million loan from a Russian bank in 2014. The article’s sources said that the Kremlin eyes the forthcoming UK referendum on Europe, and the election of Jeremy Corbyn as Labour leader, as potential opportunities to weaken Europe. Andrew Foxall, director of the Russian centre at the Henry Jackson Society think tank, is quoted as saying that Russia has become “more audacious” in its approach as it attempts to fight off the Crimea sanctions. “No-one is suggesting that Corbyn is on the payroll of the Kremlin at all – simply that his interests demonstrably overlap with what the Kremlin is saying. Russia has ramped up its influencing policy and is trying to achieve in six months or a year what it previously took a decade to achieve. “Wherever the opportunity presents itself, Russia wants to undermine the West – to present the argument that the West is no better than they are. It wants to see an end of the European Union because it much prefers a policy of divide and rule,” Foxall is reported to have said. I wander, are USA so stupid to belive that we cannot see that they are at the origins of ISIS, is CIA so stupid to believe that we cannot see that his Syria destabilisation has raised millions migrant movements, a lot of them marching on Europe (like “saints” or terror angels)? Who is dividing and weakening Europe? You’re not wrong but it think Europe is the Origins of their own Mess too ! Every Leader acts on their own ! No one elected E.U. President nor a base constitution to protect people inside the E.U. No federal imigration departements ! Nothing !! Still Angela wellcomes them through the external border ! Who bombed Lybia in 2010 ? French and the U.K. Don’t let forget this besides NA ! Obama or the whole U.S. gives a f*ck on what’s going inside the E.U. ! At least the U.S. in a Unit help States each others ! Here inside the E.U. or Zone19 – we are fighting each other instead to helping each other ! Nothing to be proud about ! Europeans wants to splitt because of nationalism then let’s splitt ! The E.U. is coward not to go to a Unit ! Fault of the E.U. States Governors not wanna have a Leader on their head and a base constitution to protect their own People ! Prise the U.S.! You are perfectly right, as long as the european countries will push their differences instead of highlighting their common values, the EU will remain a sort of a kir (Turkish term). In the same time, if you have a look at the TTIP negotiations you will be able to see that the USA economic and strategic policy does not need a united Europe competition! This situation was clear by the 6 member EC time, our days, a lot of people prefer not to see, or turn their eyes when they are not simply closing them. So, USA plays the “divide et impera” play, as well as Russia. Me too, I prefer CIA to KGB!!!! The USA can see that Europe is dependent upon them for their defense, therefore, the USA can do whatever they damn well please in the European theater. Europeans are dividing and weakening Europe through their individual nationalistic agendas. In other words EU is light years away from governing independent of USA influence. iT IS INTERESTING THAT THESE COMMENTS SHOULD ARISE SO LATE IN THE DAY. CANJ ANYONE EXPLAIN WHY THERE SHOULD BE AN AMERICAN AIR FORCE BASE MASQUERADING AS NATO IN THE UKRAINE? AND NOW THE SAME IS POTENTIALLY HAPPENING IN AZERBAIJAN. PEOPLE SHOULD REALISE THAT WHEN THE RUSSIA OF THE USSR DAYS WERE AROUND THE USA DECRIED THE FACT THAT RUSSIAN ISSUES OF SUPPORTING CUBA WERE NOT ACCEPTABLE TO THE THEN US GOVERNMENT. SO WHEN IT IS IN REVERSE CAN ANYONE SERIOUSLY CONSIDER THAT RUSSIA MIGHT NOT BE EQUALLY ANNOYED! HOW MANY POLITICAL PARTIES WITHIN EUROPE DOES THE USA SUPPORT FINANCIALLY? IN THE UK WE SEE THE CONSERVATIVE PARTY HAVING VERY CLOSE LINKS TO THE REPUBLICAN PARTY AND ALLEGEDLY THROUGH CONVENIENT RESIDENTS IN THE CARIBBEAN. THE SAME IS SEEN IN OTHER COUNTRIES WITH SOME VERY CLOSE LINKS IN HUNGARY AND POLAND AND CZECH SLOVAKIA AND SE EUROPE. 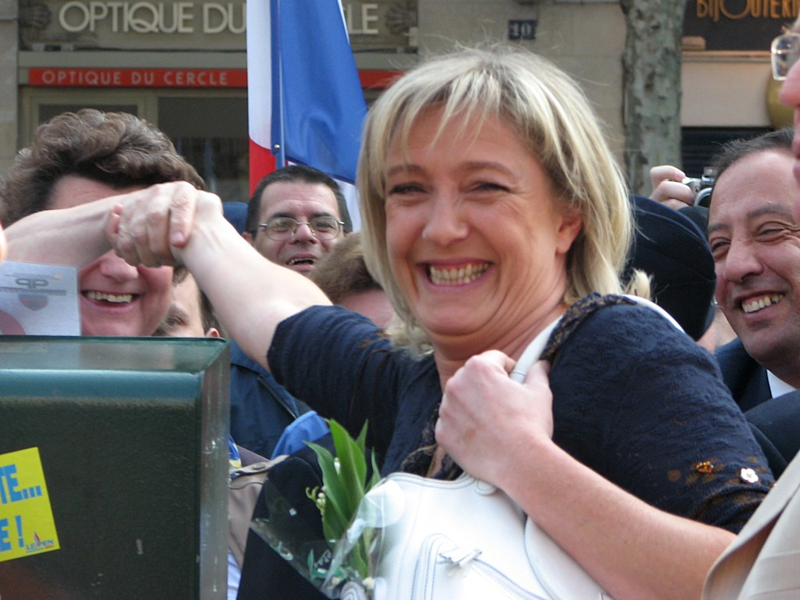 IT IS NOT JUST THE NATIONAL FRONT IN FRANCE. IT IS ALSO RUMOURED THAT THE UKIP IN THE UK IS BEING BANKED FROM THE USA, AS ALSO ARE THE EQUIVALENTS IN NETHERLANDS AND DENMARK AND ACROSS THE BALTIC STATES. I strongly suggest the US should investigate the illiberal left wing of EU Politics which has created and now aggravates the situation vis a vis islam.